Illinois sells $550 million in bonds for transportation and infrastructure. Banks that bought the debt, which was sold on Thursday, June 16, demanded a much higher interest rate than they charge to other U.S. states. The package of bonds, which bear maturity dates from 1 to 25 years from the present date, were sold at prices that created an average interest cost of Illinois taxpayers of 3.74%. While that number may seem low, it was far higher than the rate charged by the market against other borrowers in the current environment of global rock-bottom rates on fixed-income investments. For example, with respect to a benchmark 10-year bond that was part of this week’s underwriting package, Illinois was required to pledge to pay an interest rate that was 185 basis points (1.85%) higher than the interest rate currently paid by AAA-rated borrowers. Illinois is currently rated at Baa-2 by Moody’s, the key credit-rating firm. The negative reaction from the financial markets followed an admission by the State of Illinois and its underwriters that its worsening financial picture could entangle its ability to service its debts. The admission, contained in a prospectus for the $550 million general obligation (GO) bond sale, warned that Illinois’ cash flow is being pulled in a wide variety of directions. The prospectus stated frankly that these calls upon the State’s cash flow add up to much more money than the State is taking in, and reflects the increasing burdens imposed by medical costs incurred by legitimate recipients of health-care aid, pension payments, and other expense areas that are increasing much faster than growth in the Illinois and U.S. economies. The prospectus’s warning added up to an admission that Illinois’ structural deficit has now become a direct threat to its credit rating and fiscal standing. Market analysts pointed out that the worsening Illinois credit position has imposed a direct penalty upon its interest rates. The spread against AAA that Illinois taxpayers must pay has widened from 154 basis points in January to 185 basis points five months later. Of the $550 million borrowed this week, $330 million is earmarked for mass transit projects, $200 million for road construction, and $20 million for other infrastructure. Road and bridge maintenance lead to push to reopen capital spending cycle. Illinois’ general funds budget impasse has led to problems in other areas where money is available, particularly capital spending for roads and bridges. In these capital-spending areas, money from taxes other than income and sales taxes are set aside for specific uses defined by State law. The largest of these set-asides is money from the State per-gallon tax on motor fuel, which is put into the Road Fund and used to rebuild state-maintained roads and bridges. Governor Bruce Rauner and House Republican leaders called on Wednesday, June 15 for the immediate enactment of a “stopgap” road construction bill to maintain the State’s transportation program. Contracting crews go out to many locations every summer to relay concrete and perform needed road maintenance. This work continued even after the Illinois budget process came to a halt in June 2015. However, the State’s legal counsel and accounting staff have now advised State leadership that this cannot continue on into FY17. The director of the Illinois Department of Transportation, Randy Blankenhorn, warned reporters at a Wednesday news conference that his Department will be forced to suspend the IDOT construction program at month’s end unless money is released before then by law for transfer to contractors. While Illinois borrowed $550 million on Thursday, June 16 to meet immediate portions of the capital-infrastructure needs covered by this warning, none of this money can legally be spent unless an authorization can be wrung out of the Democrat-controlled Illinois General Assembly. Comptroller Munger adds voice to calls for balanced budget action. The Comptroller maintains a website and a Twitter feed that track the ongoing pileup of Illinois unpaid bills. As of Thursday, June 16, this number had passed $7.58 billion. These unpaid bills are owed to healthcare providers, providers of community social services, providers of essential supplies to residential facilities and prisons, and other involuntary creditors of the State. The numbers tracked by Munger serve as a reminder that the Illinois General Assembly’s Democratic majorities failed to pass a constitutional balanced budget in spring 2015 for FY16, which began on July 1, 2015. This lack of a budget and of budgetary spending controls have choked off much of the cash flow needed by creditors dependent upon Illinois’ good name and prompt payments, while other areas of Illinois spending proceed unhindered because they are covered by court orders, consent decrees, and continuing appropriations. Illinois Department of Employment Security (IDES) announces 0.2% drop in Illinois jobless rate. In May 2016, the jobless rate declined from 6.6% to 6.4%. The widely-tracked figure of Illinois economic strength was released on Thursday, June 16. IDES did not say that the decline was the result of any special strength in Illinois job creation. The unemployment rate remained significantly higher than one year earlier (from 5.9% to 6.4%) and only 46,400 net new jobs have been created in Illinois during this twelve-month period, an increase of less than 0.8%. Illinois continues to support fewer total jobs than were paid during the most recent period of peak employment, a benchmark reached in September 2000. The drop in the month-by-month unemployment rate was attributed, by IDES Director Jeff Mays, to an overall decline in the Illinois workforce as Illinoisans leave the state or drop out of the employment picture. Illinois lost 2,500 jobs overall in May 2016. Areas of comparative Illinois strength continued to be financial activities and professional and business services, with 3,200 jobs created in these two sectors in May 2016. Educational and health services saw a net loss of 2,300 jobs, partly due to significant layoffs in Illinois higher education associated with the current budget situation. The budget situation also contributed to a net loss of 2,100 jobs in government. Illinois manufacturing lost 1,100 jobs, in line with long-term trends in the factory sector. School districts begin to plan for truncated 2016-17 school year. A shortened school year could become a reality in Illinois if no State budget is enacted to appropriate money to public school districts. While education was funded in 2015-16 even in the absence of a state budget, this happened because the General Assembly passed a one-year spending bill that packaged together most of the usual line-items of State school aid. Democratic legislators last spring suspended what has become their overall refusal to appropriate money in a form tolerable to Governor Rauner and appropriated money for schools. However, the same lawmakers have so far refused to do the same thing this year. School district spokespersons are telling the press that they are making plans for emergency budgets that will not include State school aid. Most school districts are dependent on both property tax revenue and State school aid, and will suffer if deprived of either source of funding. For example, the Monmouth-Roseville school board in west central Illinois is making preliminary plans to shut down operations and lay off teachers/other educational personnel after one semester of the 2016-17 school year. The plans include a proposal to hold an early graduation ceremony for the high school seniors of the district. 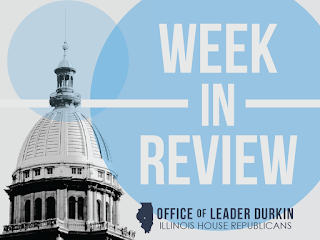 Illinois House session cancelled; negotiations continue to end budget impasse. 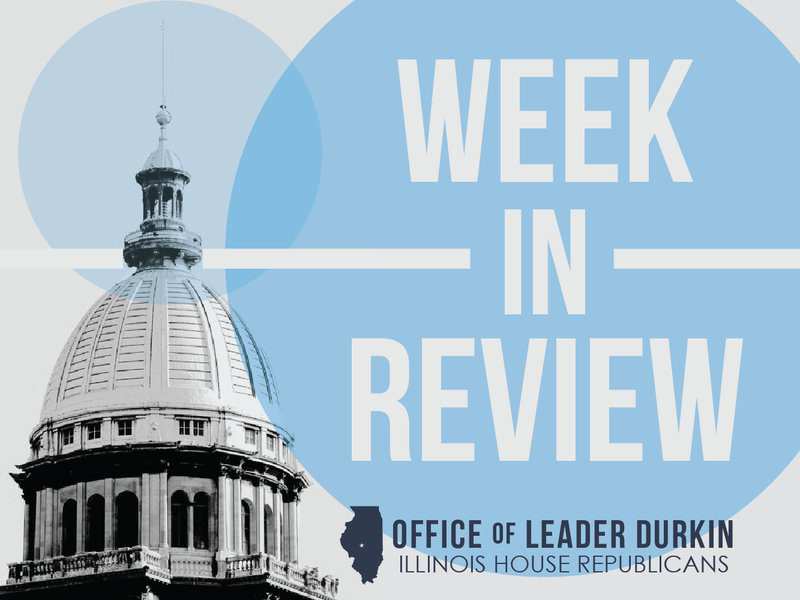 House Republicans have been full participants in the continuing negotiations that are taking place to develop answers to the current questions that are affecting the Illinois budget. Talks are taking place on a variety of related issues that include school funding, higher education funding, funding for social services, labor/management reforms, and public-sector personnel expense issues. House Speaker Michael Madigan cancelled the second of four scheduled Wednesday session days this week. Lawmakers would have met on June 15 to enable public discussion and debate on these issues, but as a result of the cancellation no meeting took place. The cancellation was criticized by Republicans, headed by Governor Rauner, who want all sides to work together to end the current impasse. “We’ve got to keep the government running,” Rauner asserted. Rep. Anthony resigns to take position with IDOC. Representative John Anthony of the 75th District, an Interstate 80-oriented district centering on Morris, Illinois, announced his resignation from the Illinois House this week in order to take on a new opportunity with the Illinois Department of Corrections. The lawmaker’s last full day in the Illinois House was Thursday, June 16. Anthony, a former sheriff’s deputy, specialized in questions of criminal law and law enforcement in the House. Republican Leader Jim Durkin praised Rep. Anthony’s work in the General Assembly. “A former law enforcement officer, John quickly became a go-to guy on issues related to criminal justice and corrections. His expertise and insight on these matters will be missed,” Leader Durkin said. During his time in the Illinois House, Anthony was the lead Republican co-sponsor of HB 1, the bipartisan 2015 measure to reform Illinois laws relating to heroin addiction, other opiate addictions and opiate-related deaths. HB 1 includes provisions to place opiate agonist drugs, such as Naloxone, in the hands of police officers and other first responders. Moody’s places Illinois public universities under credit-rating review. The review process could result in Moody’s downgrading the outstanding public debt of seven public universities: the University of Illinois, Illinois State University, Southern Illinois University, Northern Illinois University, Governors State University, Northeastern Illinois University, and Eastern Illinois University. All of these Illinois institutions of public higher education have extensive infrastructural needs that are supported by periodic recourse to the capital markets. Moody’s stated that the schools are vulnerable to the State budget stalemate. The General Assembly’s Democratic majority did not enact a budget bill in May 2016 to provide operating funds for Illinois State universities in the 2016-17 school year. The U of I, ISU and SIU currently have investment-grade credit ratings that are actually better than those enjoyed by the State of Illinois as a whole; their revenue streams are backed up not only by political decisions, but by other monies coming in, such as tuition, student fees, and federal loans and grants. General Assembly panel grants approval to plan allowing Illinois State Museum to be reopened. The plan, approved by the Joint Committee on Administrative Rules (JCAR) on Tuesday, June 14, includes provisions to allow the museum to charge an admission fee of $5. Children, members of the U.S. armed services, veterans, and senior citizens are expected to be admitted free. The flagship Illinois museum provides a Springfield exhibit space dedicated to natural history and Illinois culture. Representatives Sara Wojcicki Jimenez and Tim Butler, of Springfield, advocated for the reopening of the flagship museum. The museum, closed since October 2015, could open as soon as July 2. A relatively rapid reopening schedule is desirable in order to help the museum, which drew about 200,000 visitors a year as a free attraction, retain its museum accreditation status. Other facilities connected with the Illinois State Museum may or may not reopen on a case-by-case basis. Dickson Mounds, near Lewistown in west-central Illinois, is also scheduled to reopen on July 2. Representative Mike Unes, of Pekin, worked to reopen Dickson Mounds. Unlike the flagship Museum in Springfield, Dickson Mounds is scheduled to reopen as a free museum. However, three other satellite sites connected with the museum located in downtown Chicago, suburban Lockport, and southern Illinois’ Rend Lake, are scheduled to remain closed indefinitely. The Illinois State Museum has expressed a desire to develop cost-sharing partnership agreements with local stakeholders that would enable the reopening of one or more of these closed-down facilities. New Skittles production line opens near Chicago. The factory, located in the Kendall County seat of Yorkville, will produce Skittles candy for the Wm. Wrigley Co. The confectioner, which has longtime ties to Illinois, has expanded its production of the colored candies outward from their existing Waco, Texas factory. Up to 75 new employees will be hired in Illinois. William Wrigley credited incentives from the Illinois Department of Commerce and Economic Opportunity (DCEO) for the decision to site the new production in Illinois. DCEO operates a package of workforce development programs that include job training and employment development for prospective employers in Illinois. Rauner administration seeks expedited resolution of AFSCME case. The labor negotiations between the Rauner administration and AFSCME, the labor union that represents 38,000 state workers, have not yet generated a contract. The Rauner administration has asked AFSCME to grant various concessions, including a wage freeze and a significant increase in AFSCME member and retiree health care co-payments and other forms of cost sharing, and AFSCME has so far refused. Under state labor law, a series of procedures are laid out to follow in the case of an unresolved public-sector labor contract situation, including a recommendation by an administrative law judge. The Rauner administration this week took legal steps to expedite a resolution of the ongoing dispute. These steps included a move to legally bypass the administrative-judge step in the dispute resolution pathway. The Rauner administration has stated that the health-care concessions they are seeking from AFSCME and its members could save taxpayers as much as $35 million to $40 million/month. These savings could be applied immediately to the cash-flow situation currently facing the State. The case is currently before the Illinois Labor Relations Board (ILRB), which could declare that talks are at an impasse. The administration’s move became public on Tuesday, June 14.